Each day in America, it is estimated that 160,000 students stay home from school to avoid being bullied. If you take a look at the media headlines in any given week, it's easy to see that bullying is a growing problem in our schools. The good news is that it is a problem that many teachers can help tackle by creating a bully-free classroom, something that is easier to do than one might think. "We all know that bullying is a major concern in our schools," explains Peter J. Goodman, author of the book "We're All Different But We're All Kitty Cats." "But there are things teachers can do to help address this problem and prevent it from happening." Goodman has now bundled his popular book with an educational curriculum package, which helps children identify and work through their emotions and feelings. The combined tools use cats as characters to help teach children about bullying and accepting others even if they have differences. The curriculum, titled "Bully Free Students Make Bully Free Classrooms," focuses on such lessons as what bullying is and feelings and bullying, helping children to identify feelings and how to make the right decisions when they do. "Being able to integrate a bullying curriculum into the classroom is an effective way to help tackle this problem," says Julia Anderson, Ed.D, a primary school teacher at Arlington Public Schools. "The subject needs to be there at every level during the elementary school years so that the foundation has been laid." "When you combine several of these factors, you will have a much greater chance of creating a bully-free classroom," added Goodman. "Children learn when they have fun, when the information is repeated, and when they can actively play a role." "Teachers have to be more proactive in this area so that we can create a safer classroom," explains Karen Goldberg, a licensed clinical social worker who specializes in working with parents and families. "Addressing the issue now and creating a bully-free classroom can save a lot of problems from occurring later on. Plus, the kids learn skills they can use for a lifetime." dreamBIG Press is a publishing house that has created a series of children's books titled We're All Different But We're All Kitty Cats. The books are designed for elementary-school-aged children, to tackle common issues that they may encounter such as bullying, childhood fears, confidence, being different, and making friends. Through the use of a cast of cats, the author helps children better understand those issues, and learn how to deal with them. The company was started by Peter J. Goodman, a multimedia children's author and president of Gut Instinct Creative, an award-winning marketing communications company. For more information about dreamBIG Press or the book series, visit the site at: www.kittycatsbook.com or our YouTube channel www.youtube.com/kittycatsbook. Marcelo Lancman, M.D., offers his knowledge and experience with epilepsy in What You Need to Know if Epilepsy Has Touched Your Life: A Guide in Plain English (ISBN 1475105312). Written for those living with epilepsy as well as their family members, friends and caregivers, Lancman's work acts as a guide and resource for this common brain disorder. A baby bootie that could help prevent sudden infant death syndrome won Jacob Colvin the title of BYU Student Innovator of the Year. The boot monitors a sleeping infant's heart rate and blood oxygen. See the boot in this video. In 2013, millions of Americans won't have access to regular dental care. Some countries use nondentists, generally called "midlevel providers," to drill, fill and extract teeth for underserved populations. But is this a solution for the U.S.? A new study in the Journal of the American Dental Association evaluates how nondentist midlevel providers affect the population's oral health and the rate of cavities, and whether they're cost- effective in delivering care. Click here to access a multimedia website with audio and HD video bites and links to other resources. The holidays may be over but this book makes gluten-free dessert cooking easy anytime. I made spritz cookies during the holidays and they were a family favorite. I also cooked spritz cookies with regular white wheat flour. The gluten-free cookies were not as sweet so I added chocolate decoration. Everyone in the family and my guests enjoyed the gluten-free cookies better than the flour ones. On another occasion I baked the gluten-free scones. They were a nice addition to a great chili-cheese soup that my family loves. Baking the scones was easy and a lot less calories than deep-fried. Preparing gluten-free meals for part of the family makes cooking challenging at best. Making desserts that everyone likes is even more difficult. Jeanne Sauvage's Gluten-Free Baking for the Holidays has made dessert preparation just that much easier. The book has 60 recipes for traditional festive treats, including favorites like apple pie, plum pudding, rugelach, bûche de Noël—even a gingerbread house. It also includes a complete list of sources for finding gluten-free ingredients including flours (brown rice, tapioca, and more) and xantham gum and tips on how wheat-free ingredients work. Jeanne adds her own all-purpose flour mixture, which she personally developed for gluten-free baking. Jeanne Sauvage writes a popular blog "The Art of Gluten-Free Baking" which she started after discovering her child was gluten intolerant. She lives in Seattle. The photography in the book is done by Seattle-based food photographer Clare Barboza. Gluten-Free Baking for the Holidays is published by Chronicle Books <chroniclebooks.com>. A gorgeous table begins with beautiful napkin folds. 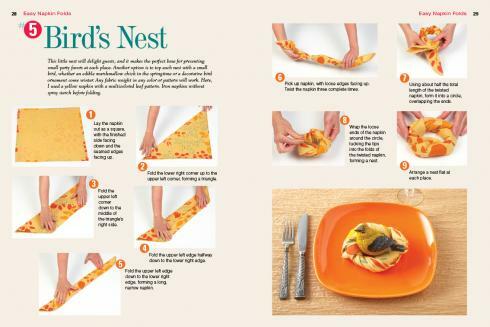 Knowing how to execute a perfect napkin fold is not a skill everyone has, but it’s one you can easily and quickly teach yourself — with Denise’s help, of course! 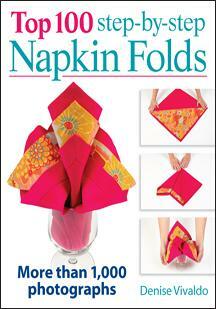 Napkin folds immediately bring a touch of elegance, whimsy or retro style to your table. And they take your table setting to the next level with no added expense — you’re just learning dozens of clever new ways to present the napkins you have. The 100 folds are divided into easy, intermediate and advanced sections, so you’ll know which ones to start with and how to work your way up. Simpler is often better, and the most formal folds, in fact, tend to be relatively easy. And when you’re using napkins with an elaborate pattern or design, a simple fold may show it off best. The concealed wire-o hardcover format means the book lies flat when open, making following instructions a breeze. Like a handwritten thank-you note, napkin folds might be less common than they once were, but they’re always noticed, always appreciated and always in style. About the author: Denise ViValdo is a seasoned food professional who has catered more than 10,000 parties. she’s the founder of Food Fanatics, a recipe development, food styling and catering firm. she’s catered everything from the academy awards governor’s ball to Hollywood wrap parties. For the estimated one-third of Americans who will make New Year's resolutions to eat better and lose weight in the upcoming months, they might consider flax seeds combined with chia seeds to help them achieve their goals. The combination of organic milled flax and chia together offers a food that is almost unrivaled in its fiber and healthy fat content and is a great component for helping New Year resolutioners lose and maintain their weight. Many dieters have found that organic milled flax and chia seeds have been a key to keeping them feeling satisfied. Nutritionist, Deborah Orlick Levy, MS, RD, encourages her patients to incorporate flax into their daily nutrition plans and explains, "Flax is one of the best sources of Omega 3 healthy fat that can help speed the process of losing weight while also helping to reduce the risk of heart disease and stroke. It is also beneficial in alleviating symptoms of hypertension, joint pain, and an array of other ailments. I often tell people that you can spend your money on healthy eating now or you can spend your money at the doctor's office later in life." Carrington Farms offers a flax-chia combination that combines organic milled flax seeds with chia seeds resulting in a nutritious blend with a wealth of health benefits. Chia seeds, low in carbs and gluten free, are packed with Omega 3's, vitamins, antioxidants, protein, fiber, and minerals such as calcium, magnesium and zinc. Organic milled flax seeds are also loaded with Omega 3's, fiber, antioxidants, and minerals, but have the added benefit of hormone balancing phytoestrogens called lignans, all of which help promote a healthy lifestyle. 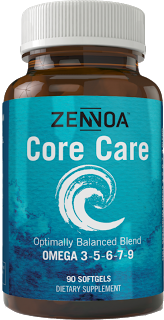 Together, the perfect balance of the combined blend provides an excellent source of energy and nutrients for lasting heart health and boosted metabolism resulting in the ultimate "Superfood". Healthy eating this New Year will begin in the kitchen and the Flax Chia blend offers the convenience of nutrition that can easily and tastily be incorporated into the daily meal prep routine for breakfast, lunch and dinner. With a delicious and subtle nutty flavor, it can be sprinkled over cereals, oatmeal or yogurt for breakfast or used as a tasty topping for salads or casseroles for lunch and dinner. It can even be used in place of eggs in recipes such as meatloaf and hamburgers, or as a coating on kid-friendly chicken nuggets. For over a decade, Carrington Farms has been providing health-conscious consumers with healthy yet delicious products. The company is committed to offering the freshest and best-tasting organic flax seed that nature has grown. To that end, each batch of flax seed that goes into the Carrington product line is stringently tested and guaranteed to be both 100 % organic and non-genetically modified. This rigorous quality assurance process ensures an end product that is the highest-quality, cleanest seed available. Carrington's focus on a healthy lifestyle is summed up by its slogan: "Healthy Foods for a Healthy Soul." For additional information on the company, please visit http://www.carringtonfarms.com/. As the New Year approaches, Americans are ready to make their resolutions for a healthier, happier, more prosperous 2013. Statistically speaking, nearly half of the country will make a New Year's Resolution. Losing weight tops the list of most common resolutions, but a more general "stay fit and healthy" is the fifth most popular goal people set for January 1. With health and weight-related goals, much of the focus falls on food and exercise. Maintaining a balanced diet and exercising regularly are essential to reducing body fat, improving organ function, and boosting overall health. However, getting enough quality sleep can help improve health and weight loss efforts. Research has shown that people who get the proper amount of sleep each night (typically eight hours for an adult) have an easier time sticking to an exercise regimen and making healthier food choices. Better sleep has also been linked to better mental health and, for children, better behavior in school. "Barriers to sleep include lifestyle choices, caffeine consumption, and even the bed itself," says Mark Wells of Sleep City and Sleepcity.com. December 31, 2012- (Sparta, NJ) - One business woman from New Jersey has the simple answer for everyone who struggles with New Year's resolutions: wake up and seize the day. Cathy Beggan, founder of Rise-N-Shine, LLC, early morning specialist and creator of Wake Up On Time, suggests five ways to wake up early to reach your goals for a positive and more productive 2013. "A study from the University of Toronto suggests that early morning risers are happier than their late night counter- parts and have a more positive and motivated outlook," said Beggan. "Committing to a resolution to wake up early and be more productive is important because it provides motivation which is a critical step in achieving your goals." Beggan suggests the following five ways to wake up early, feeling refreshed, motivated and committed to making 2013 a more successful and productive new year. Prepare yourself the night before. Facilitate the transition to morning person by getting some of the everyday task out of the way the night before. Think positive thoughts. The night before, write down one positive thought, memory, goal or affirmation and read it when you wake up; Carpe Diem. Keep your body hydrated. Drink water before bed and when you rise in the morning. The body becomes dehydrated during sleep and lack of water causes many fatigue symptoms in the morning. Get enough sleep and try to be consistent. Everyone's sleep allowance is different, so judge accordingly, but it's more important to go to bed and wake up at the same time every day. Keep your body alive and well with all-natural vitamins, herbs and amino acids. They boost energy levels and immune systems, while elevating moods and enhancing metabolism. The body does most of its regeneration during sleep at night. Everyone has been there. The heart ache and heart break of being dumped; the difficulty of getting out of bed each morning just wanting to stay in bed in fetal position crying; feeling helpless and alone; spending hours upon hours at the gym and not eating. 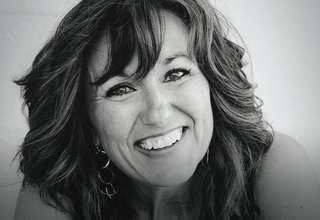 Business and life coach Caird Urquhart shares a very personal self-help guide teaching women how to use that grief, become proactive and bounce back to reality with 30 Ways to Better Days: How to Rally After You've Been Dumped. Throughout the book, Caird shares the brutally honest truth of how to navigate through the gut-wrenching days of a breakup and apply little yet essential changes for daily growth. The book is in essence a tool -- even a best friend -- to let go of the anger and become optimistic about life and the endless possibilities in the world. It promises to raise self-esteem so one can overcome their fears and reach goals. Using the book as a tool to recover from her own heartbreak, Caird pours her heart and soul into this book, sharing her own personal experiences. "It takes living through each season, each holiday, each 'What were we doing at this time last year?' to really clear your mind," says Caird. "My book moves the reader out of feeling badly about their situation and into taking action to reclaim their lives." 30 Ways to Better Days...How to Rally After You've Been Dumped is a self-help book aimed at women who have just gone through a relationship breakup. The chapters in the book are short and sweet and was written as an easy to read, no nonsense handbook with the intention of helping women of all ages lift their self-esteem and become empowered to move on. With 18 years of experience in the film and television industry as a producer, casting director and actor, Caird became a personal and business coach. After graduating from The Coaches Training Institute and being accredited by the International Coaches Federation, she founded New Road Coaching Inc. in October of 2005. Since then, Newroad has been working with entrepreneurs, executives, athletes and entertainers to help them achieve the big picture possibilities of their lives. Her hope as a coach is to be able to share the true magic of the entertainment industry; that dreams can become reality. 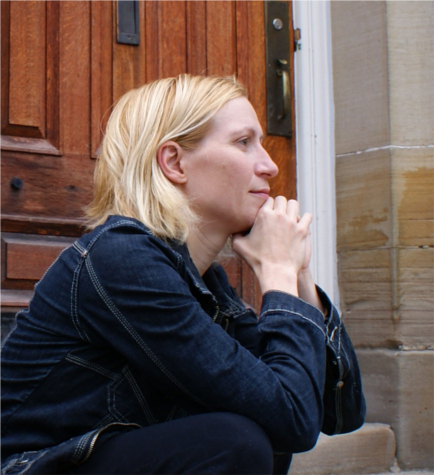 Caird lives in Toronto, Canada where she is the proud Aunt to ten nieces and nephews. She has a Bachelor of Arts Degree with majors in Psychology and Physical Education from Wilfred Laurier University. And is a member of the Canadian Association of Family Enterprise, Canadian Association of Women Executive and Entrepreneurs, Company of Women, Women in Film and Television, The Economic Club and The Empire Club of Canada. 30 Ways to Better Days...How to Rally After You've Been Dumped is available now at: www.newroadcoaching.com. San Francisco, CA (December 31, 2012) – Author Jenn Flaa isn't your average successful woman entrepreneur – she's a satellite engineer who began her career working at NASA testing space flight hardware and software. She then started a few successful businesses and earned clients like eBay, Dell, Microsoft and the US Air Force. If that isn't unique enough, Jenn is also the lead vocalist for the rock band, Urban Fiction. 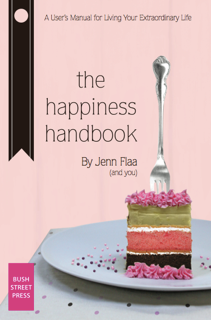 So what qualifies Jenn to write a book about happiness? Well, she's happy for starters. "I wasn't always happy," says Jenn. "I've been knocked around by life just like everyone else. But when I realized that the true key to happiness is so easy, I gradually became happier. It's not an overnight process, but it's simpler than most people realize." The Happiness Handbook, a definitive guide to finding true joy and living your extraordinary life, is a short, casual read packed with universally relevant action steps. Readers learn key steps from author breakout Jenn Flaa's multi-year journey. She began her transformation as a chubby, miserable divorcee, owner of a struggling high tech company, and singer that hadn't sung in a decade. She is now a successful author, entrepreneur and rocker chick who is living large as the CEO of two thriving companies, singing lead in a rock band and is blissfully happy in a fulfilling relationship. The Happiness Handbook offers readers an engaging approach to the age-old challenge of communication in relationships, guiding them through a fun process to identify, articulate and receive what makes them happy – and most importantly – teaching them the happy dance! Flaa's premise that none of us come with a user's manual is illustrative of the author's humorous voice – providing readers with the ultimate insider's guide to finding happiness – whether they are single or in a relationship. A key theme throughout the book: men are hardwired to make their women happy. So why are so many relationships struggling? Women aren't being clear enough! "Everybody, no matter what their belief system, wants exactly the same thing for their loved ones -- to be healthy and happy," states Flaa. "So isn't it our responsibility to be proactive in the process? If we are happy, then our loved ones are happy. It's a perfect circle but YOU have to start it." Ironically, it was Jenn's male friends that urged her to write this book. She had noticed an underlying theme in her previous relationships – she wasn't being clear about what made her happy and when something did make her happy, she was guilty of not enthusiastically receiving it. She course corrected and the new concepts worked well - not only with boyfriends, but in all her relationships. Her friends wanted it all in writing so they could have the same chance at happiness in their relationships. And so The Happiness Handbook was born. Born and raised in the sweeping vistas of Minnesota's cornfields, Jenn Flaa's early interests were steeped in the arts. She took a detour in college into technology and began her career doing software testing at NASA in Maryland. After an eye-opening business trip to California, she realized she belonged in Marin County and relocated. Then she did a couple of stints at high-tech start-ups before she established her own companies, Vettanna (high-tech staffing and strategic communications) and Vettanna ToGo (on camera training). After her divorce, Jenn's creative voice re-emerged and she jumped back wholeheartedly into the arts, rocking out as the lead singer in her band Urban Fiction. Jenn currently resides in Marin, is blissfully in love, very happy and ironically, working on another space project. The Happiness Handbook is available on amazon.com. More at www.happiness-handbook.com. In her debut book The Healing Dance, former National Ballet of Canada company dancer, three-time DORA award-winning choreographer and certified psychotherapist Kathleen Rea pulls back the stage curtain and reveals a history of anorexia, bulimia and self-harm that plagues so many professional ballerinas, who introduce potentially life-threatening 'ideals' to young minds who look up to them as the epitome of elegance, beauty and control. Says Rea: "The strict rules of ballet instantly resonated with me as a child because they provided a set of ideals to reach for—a magical recipe that promised to make everything right. But my world of perfect pliés and pretty pirouettes quickly collapsed. Starvation was not only accepted -- but encouraged -- by my employers." Kathleen Rea is a former National Ballet of Canada company dancer, Dora award-winning choreographer and certified psychotherapist. She holds a diploma in expressive art therapy from ISIS-Canada, a certificate in psychology from Ryerson University and a master's degree in expressive arts therapy with a minor in psychology from the European Graduate School. A practicing therapist for the past twelve years, she is also a therapeutic performance facilitator, helping people express their life stories through multidisciplinary performance. The Healing Dance is available in all major online retailers and select major and independent bookstores across North America.